This year, BIEN celebrated the 30th anniversary of its birth. In commemoration of the occasion, founding members reunited at its birthplace–the Université Catholique de Louvain in Louvain-la-Neuve, Beglium–for a series of talks on the past and future of BIEN and the basic income movement. 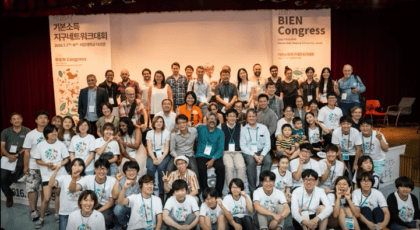 Photo: Participants at BIEN’s 2016 Congress in Seoul (bien2016.org/en).